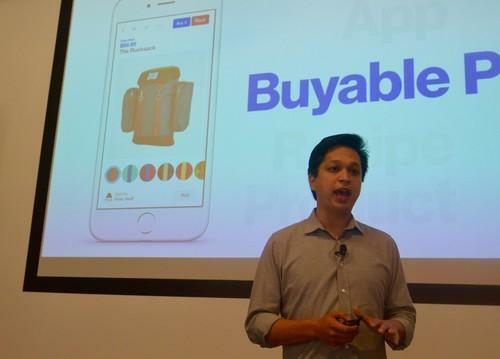 Pinterest CEO Ben Silbermann, discussing the company's new e-commerce product on June 2, 2015, in San Francisco. Content on Pinterest's site is organized into visual bookmarks or "pins," which users can save to their own profiles. Starting later this month, a new type of pin called "Buyable Pins" will arrive in users' feeds, to let them purchase a variety of items without leaving Pinterest's site. More than 2 million different products will be sold on Pinterest, through partnerships with major retailers like Macy's, Nordstrom and Neiman Marcus, as well as smaller boutique brands like Cole Haan, Kate Spade and Poler Stuff. The pins will first appear on Pinterest's iPhone and iPad apps, and will come to additional platforms after that, Pinterest CEO Ben Silbermann said Tuesday during an announcement at Pinterest's headquarters in San Francisco. With the changes, Pinterest is making a serious push into e-commerce, at a time when some of its largest rivals are doing the same. Other popular online services like Facebook, Twitter and most recently Facebook's Instagram are trying out new ways to let people buy items from their own sites. The new pins will appear in people's feeds when they're relevant, including after users perform a search on the site, Pinterest engineers said during the event. Users must enter their credit information to purchase the items. The new feature is also integrated with Apple's Apple Pay system. Pinterest's servers never touch users' credit card information, engineers said. Once a user enters his or her credit card information, it's sent encrypted to Pinterest's payment partners who store it securely; from there the merchant receives the payment. In addition to Apple, Pinterest's payment partners include Braintree and Stripe. On Pinterest, items will be priced the same as they would be on merchant's own sites, said Michael Yamartino, head of commerce at Pinterest.